Temper some dark chocolate, then stir in pieces of marshmallow, chopped nuts (I used brazil nuts), crystallised ginger pieces and cacao nibs. Scrape the whole lot into a small lined loaf tin and set briefly in the fridge. You will need to work quickly! It was surprising simple and delicious – sweet, but not overly so, and not a pink marshmallow in sight! Is that one of those little christmas cake tins you used? I might have to do this, though I still haven’t tempered chocolate… it is making my mouth water just looking at it! Yum! I loovvvve dark chocolate and ginger. And yes, we do all know exactly what bakeware you have in your kitchen….mostly because you have tempted/inspired us to buy the same too!! Thanks to you I have mini loaf pans, a FEW heavy duty bundt pans, a romertopf, chicago metallic pie pans (still unused)…. should I keep going with that list BIC….? We are just eating one left over aussie christmas cake now! I use the little tins though all the time, would not have thought of buying them if I hadn’t been inspired by you. I have a couple of bundt tins now as well, including 2 mini star pans that came free with an order from a kitchen company here called Lakeland. They make tiny little 2 egg cakes, but are very cute! :-). Friends are friends….aren’t they? 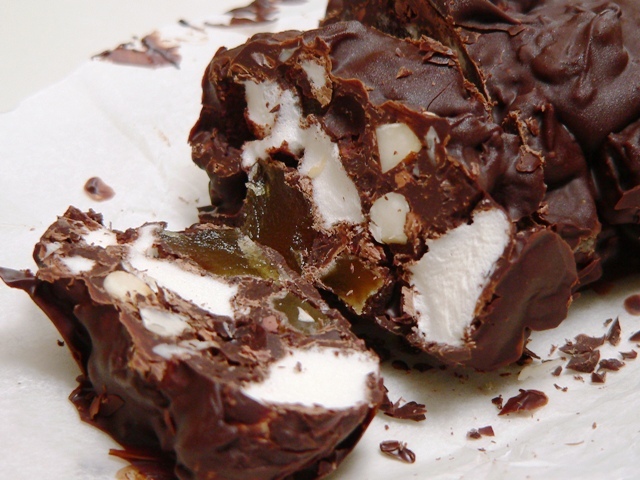 Well, FYI…I love Rocky road. Especially having had it only once – at the longest meal of my life (which started at 2 and ended at 8.pm!). Moving on…..I love ginger and I still haven’t worked on tempering chocolate…..going to read that post now! Looks good Celia and now you are indeed the right person to pose the question … ‘What makes a Rocky Road?’ I’ve always said it must contain marshmallows. When one adds biscuit … then it becomes chocolate biscuit cake eh?? Lorraine, it’s just the best combination, isn’t it? Our fruit and nut man at the markets has the best crystallised ginger I’ve ever tried – I think it’s from Buderim, but it’s sold loose, so I’m not sure. Gillian, I’m not a huge rocky road fan, mostly because it’s usually made with rubbish milk chocolate and pink marshmallows. I agree that it shouldn’t have biscuit (although I love those chocolate biscuit cakes/slices), but marshmallows are a must, as are nuts, preferably a white nut for my tastes, like brazil or macadamias. I have some Persian figs marinating in rum, and I thought they might make a nice addition to the next batch. Although it’s hard to top the ginger and cacao nibs with the dark choccy! Emma, love the gravatar! :) Yes, it is a bit scary how quick this was to make! Now this version of rocky road is sounding very good – it’s not something I’ve found particularly appealing before as it appears to be overly sweet and as you say, pink marshmellowy. So, would like to try this EXCEPT still haven’t got my head around tempering chocolate. I checked out your post on it, but you say to use some chocolate you’ve already tempered, so now sure how one starts. I do have several books that tell you how, but it always looks a bit complicated. You can buy a block of chocolate from the supermarket – they’re usually tempered (eg. Lindt). I was able to buy large chunks at my food wholesaler – they sold 5kg blocks of Callebaut, and at one stage had these broken into pieces and sold by weight. You could also try using more callets to temper the chocolate, or if you’re chopping up chocolate, keep back a big chunk of it and use that. OK, thank you Celia – I think I understand.